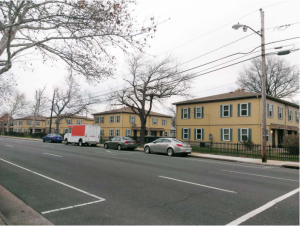 The Alexandria Redevelopment and Housing Authority (ARHA) will get a second chance to secure approval for the redevelopment of Ramsey Homes, 15 units of public housing located in the Parker-Gray District in Alexandria. After a contentious and heated City Council session on Feb 20 lasting several hours, the Council could not produce the super majority vote needed to approve the development. A petition, signed by over 20 percent of the residents surrounding Ramsey Homes to deny the application was submitted to Council the night before the hearing. This petition activated a provision in the City Code that a super majority (6-1) be required to approve demolition of the buildings and redevelopment. Three days after the hearing, Councilman Paul Smedberg – one of the no votes – announced that he had changed his mind and asked that the Feb 21 Council vote to deny the application be rescinded. Council agreed with Mr. Smedberg that too much was at stake for the current residents of Ramsey Homes and the critical need for affordable housing in the City. The vote to rescind the previous denial was unanimous. Council will take up action on the ARHA proposal on March 12, but a meeting of the ARHA Redevelopment Work Group focusing on Ramsey Homes will convene on March 2, at 5:30 PM, in the Council Work Room. The Work Group consists of two City Council members (Vice Mayor Wilson and Councilman Chapman), two ARHA Commissioners (Chair Daniel Bauman and Vice Chair Salena Zellers), as well as Mary Lyman, Chair of the Planning Commission. This meeting is open to the public and housing advocates are encouraged to attend.